In 1998, I had just moved back to St. Louis and was studying Judo with Master Shin. The world had seen the power of Brazilian Jiu Jitsu in 1994 with the first UFC and I was ready to see it for myself. In 1998, Rodrigo was at a school in Manchester. I called and left a message with Rodrigo, telling him I was interested in stopping by and training. I told him I had trained Judo and wrestling and wanted to try Jiu Jitsu. Little did I know I inadvertently put myself in the middle of an old school squabble between Judo, Jiu Jitsu and Luta Livre that started on the streets of Rio and lived on with every Brazilian Jiu Jitsu instructor from Rio. 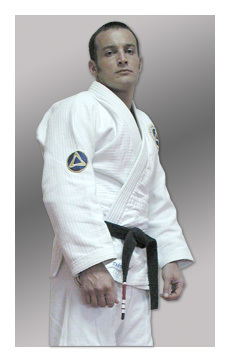 If you type ï¿½Rickson Gracie beach fightï¿½ into YouTube, you will see Rodrigoï¿½s instructor, king of the Gracie Family, Rickson, defending the honor of Jiu Jitsu by decimating Hugo Duarte, the head of Luta Livre in Brazil. Also in the crowd is Rodrigo. When Rodrigo came to America, he carried this intensity along with the Jiu Jitsu flag and was ready to fight to the death to defend its honor against all challengers, real or perceived. Enter perceived challenge, me. To make a long story short, it was a bad idea to let Rodrigo know that I was a Judo player and wrestler. Having never met Rodrigo before, I walked into his gym with my bag on my shoulder and told him, ï¿½I am here to trainï¿½. Apparently, that was the wrong choice of words. After licking my wounds for the next week, I came back to join. Rodrigo and I became very good friends and training partners over the next 15 years and I consider him like a brother. A very scary, intense older brother.